My talk yesterday went well at the International Symposium for Peace. There were about 300 people there including a slew of folks who work for the Asahi Shimbun newspaper. Following my speech I sat on a panel discussion that included Frank von Hippel, a Princeton University physicist who served as Bill Clinton's science advisor and had to give the final go-ahead for NASA to launch the Cassini space probe in 1997 that carried 72 pounds of plutonium-238 on-board. I had a chance to talk with Frank about our campaign to oppose Cassini and found him to be a very nice and thoughtful man. He has already emailed me several documents that he thought might be of use to us. Another person serving on the panel was a former Japanese ambassador to Switzerland who also worked at the UN. He began by touting Henry Kissinger's recent anti-nuclear weapons position and then said that Japan "should not be criticized for working on missile defense with the US." We need to be "more realistic" he suggested. Frank von Hippel was solid on the need to reduce nuclear weapons but never mentioned US plans for missile defense as a serious obstacle to nuclear abolition. (No one else did besides me for that matter.) He did offer an interesting story though by recalling a public poll a few years ago that asked the American people how many nuclear weapons we have today. The majority replied 200 nukes. And how many do we actually need to protect ourselves? One hundred they responded. The fact is that the US today has several thousand nukes. The use of the atomic bomb, most experts now believe, was totally unnecessary. Even people who support the decision for various reasons acknowledge that almost certainly the Japanese would have surrendered before the initial invasion planned for November. The U.S. Strategic Bombing Survey stated that officially in 1946. Hiroshima was selected because it was a significant, unblemished, mainly civilian target, available for the psychological effect of terror bombing. That's very explicit in the documents; it's not controversial. That's what they were doing. And ultimately some 300,000 civilians were killed at Hiroshima and Nagasaki. Nuclear weapons now need to be put beyond the moral pale, to be made illegitimate throughout the world, and that will not happen until people speak up and cause a shift in the cultural base. That's not impossible. Now is the time to begin-particularly when many Cold Warriors see them as no longer useful. The silence is thundering among people who seem to care about these things but don't talk about them. The way you change things is by slowly beginning to push forward. Over time something begins to happen. It happened in the feminist movement, the anti-war movement, the civil rights movement. All of those movements were totally dominated by a conservative culture that didn't seem to allow any progress until people of goodwill began to build and slowly, patiently, changed the culture. I believe it's possible to do that with regard to nuclear weapons. In my closing remarks on the panel I quoted from two recent news articles that clearly showed the US, Japan, and South Korea are intentionally over-estimating the North Korean nuclear threat. Because of economic and technological challenges the North Korea launch infrastructure is 10-20 times below the level that was once estimated. North Korea's recent missile tests revealed to the US military that they have an outdated radar system and the Pentagon came away from that experience pounding their chest in joy saying that the US, with its massive technological superiority, was able to see things that were happening during the test that North Korea could not see. This means that the US knows they could easily "take out" North Korea's missile launch system but there is a major public relations benefit to overrating the threat. The US embellishes the threat in order to create fear in the public which then translates to justification and support for a new arms race - the space variety. I ended by telling the story about former president Dwight Eisenhower's warning to the American people as he left office that included the words "beware of the military industrial complex." 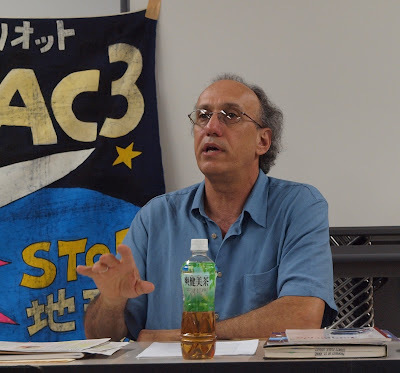 I told the audience to beware of the growing Japanese military industrial complex that has recently successfully pushed through changes in their national space policy. Their "peaceful uses of space" language is now giving way to the militarization of their space program. My greatest delight though was that an older Japanese woman, a medical doctor who has worked against nuclear weapons for many years, followed me with concluding remarks on the panel. She picked right up on the North Korea question and sternly stated that they were not a threat to Japan and that her country needed to step back, calm down, and resist making aggressive moves. It was the perfect ending and the first time during the panel discussion that anyone addressed any of the points I was making. Today I move to a different hotel in Hiroshima as I will now be staying here another four days to speak at various conferences that will be held before and during the annual August 6 remembrance days. The military being used to spy on local peace groups.....violation of law. Some years ago a Kennedy Space Center security man told me that the military has a national database of protesters that is continually updated by security teams at the various bases around the country where protests are held. I arrived in Hiroshima about 1:00 pm today and went to my hotel. The Mayor of Hiroshima is hosting an International Symposium for Peace tomorrow and I was invited to be the keynote speaker. It is more than an honor. My 45-minute speech is entitled Nuclear Weapons Abolition: The Road to Renewed Momentum. Yes, I am excited. No, I'm not nervous but would describe the energy I feel more like a lion in a cage, pacing back and forth. Today just after 3:00 pm a small group of conference guests from outside the country were taken to the Peace Memorial Park where we saw the A-Bomb Dome and were taken for a tour of the Memorial Museum. I was interviewed by some media outlets about what my message will be at the conference. I first visited the museum when I came to Hiroshima in 1984 but it has been greatly expanded since that time. There was a big crowd of people inside it as we made the tour. Just as in 1984, I thought the most gripping photo display showed the piles of bodies of the tens of thousands of people who had to be cremated or buried in mass graves. It makes it all very real. Hiroshima was never conventionally bombed (unlike most of the rest of the country) before the atomic bomb was dropped on August 6, 1945 because the US wanted to have a pure statistical sampling of the damage potential of one atom bomb. I'll write more about the controversy surrounding the US bombing in the days to come. This evening a dinner was held for the guests and and hosted by several key people from the Asahi Shimbun (one of Japan's largest national newspapers). The newspaper is co-sponsoring the international conference and covering much of the costs from what I have heard. Several people from the editorial board attended the dinner. My room is on the 31st floor of the hotel with an incredible view of the city which is surrounded by mountains. Just out my window is the ancient Hiroshima Castle with a huge moat all around it. According to Wikipedia, "Originally constructed in the 1590s, the castle was destroyed in the atomic bombing in 1945. It was rebuilt in 1958, a replica of the original which now serves as a museum of Hiroshima's history prior to World War II." I will do my best to take a walk over to the castle for a tour. It looks fascinating. At dinner tonight there was some discussion about right-wingers in the Japanese government now pressuring the Obama administration not to agree to any reductions of nuclear weapons. The Japanese hardliners want the US to maintain a vigorous nuclear "umbrella". The implied threat is that if the US does cut back on its nukes then Japan might be forced to build their own. The basic premise of my speech tomorrow will be that if a new arms race in space is allowed to go forward then we can all forget about the dream of ridding the world of nuclear weapons. So this is an important moment to be engaged in these discussions. I take the train in the morning from Kyoto to Hiroshima. It is a two-hour trip. 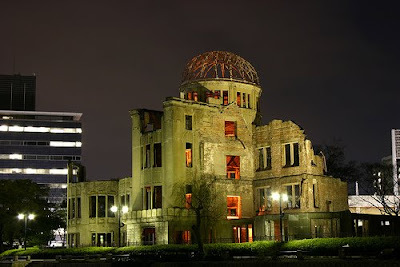 In the afternoon I will join the other speakers from the International Symposium for Peace for a tour of the Peace Memorial Museum and the famous A-bomb Dome. I will speak on August 1 at the conference. 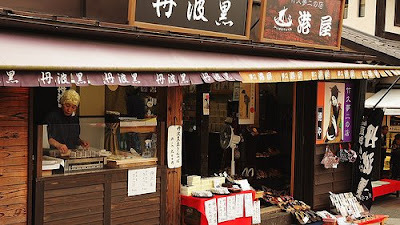 Today I spent several hours walking the back streets of Kyoto, just wandering through the neighborhoods. I ran into one temple that had the biggest carp I've ever seen swimming around in the fountain pool. It is fascinating to watch all the bicycles, walkers, and cars navigate their way through the narrow streets that were not built with the automobile in mind. One of my favorite sites was the people riding along with one hand on the handle bars and the other holding an umbrella over their head. Kind of like a circus act. Tonight Atsushi Fujioka took me out to dinner again, the fourth night in a row. I'm sampling my way around Kyoto trying out the various types of Japanese cuisine. I'd say about 10 different dishes are brought to the table, each very delicate and finely decorated. Raw tuna, eel, octopus, river fish, salmon, sea snake and the like. I eat all of it. A small bowl of rice always come last, just before the dessert. A big mug of beer washes it all down. Last night I was told that I was to be interviewed today at 2:30 pm and to wait at my hotel room. A nice young man showed up with four large cases of video equipment and set it all up in my small room. He is a lecturer at a nearby university and was interviewing me for a progressive community media TV program. He said that public access TV is rare in Japan and wanted me to emphasize the importance of developing alternative outlets during this time of corporate dominated media. I gladly did as he asked. Interesting interview with Congresswoman Maxine Waters (D-CA) who talks about how Obama's Chief of Staff Rahm Emanuel ,while in the House of Representatives, recruited many of the conservative "Blue Dog" Democrats who are now holding up the health care process. In several cases Emanuel did all he could to keep progressive Democrats from running and instead pushed the conservatives into the House seats. In the interview Rep. Waters is asked about the rumor that the Senate might drop the "public option" from their version of the health care bill. It seems as though the process is now unraveling and the insurance corporation lobby is clearly in control of the process. As a result, as Glen Ford says in the Health Care Update interview below, don't expect much from here on out. Always good coverage from The Real News....here we get the Canadian perspective. Paul Jay does his usual excellent job of getting right to the heart of the matter in this interview with journalist Eric Margolis. It's hot, it's muggy, it's been raining, and folks are treating me wonderfully. I've been in Kyoto for two days with little Internet connection. The first two nights I stayed in a traditional wooden Japanese home where I slept on a futon on the floor - Japanese style. But sadly their wireless connection didn't work so I've had to move to a hotel where I will spend the next two nights. I get hundreds of emails each day and find it impossible to be without Internet for long. A friend in California calls my laptop my "altar." I've been taken to a couple local wonderful spots including the Kiyomizu Dera Temple that overlooks the city from the base of a surrounding mountain. Just a spectacular place. Kyoto is famous for many temples and the city is crawling with tourists from all over the world. Last night I spoke to 70 people and after I talked a 3rd generation Japanese-born man of Korean ancestry spoke. I was surprised to learn that even when Koreans are born in Japan they do not automatically get citizenship. There is still discrimination here against Koreans, many of whom were brought to Japan during imperial times as virtual slave labor. Lee Tong Il spoke out in favor of North Korea's right to defend themselves from an aggressive US and Japan. He said, "For 60 years the US has brought nuclear weapons to the Korean Peninsula so North Korea has to have nuclear weapons to defend themselves." While I am opposed to all countries having nukes I must agree with his basic point that the US position is hypocritical because our nation has more nuclear weapons than any other country and we continually test them. (August 23 is the next planned US Minuteman nuclear missile test fired from Vandenberg AFB in California that will land at Kwajalein Atoll in the Pacific.) North Korea sees Iraq and Afghanistan get invaded, Iran threatened, and they figure their only chance for survival as a nation is to arm themselves as well. The big issue in Japan right now is whether or not the government should get rid of Article 9 of their Constitution that says they will not have an offensive military. Prior to WW II Japan invaded Manchuria and occupied Korea. Their colonial empire spread throughout the Pacific Region. The right-wing in Japan wants to get rid of Article 9 and is even calling for preemptive attack on North Korea. This stirs fears in the region about a resuscitated imperial Japan, coupled with a massively armed imperial US, a clear prescription for disaster. A key part of all this current trouble is the US "missile defense" program which is now being deployed in Japan, South Korea, Australia, and on Navy Aegis destroyers surrounding China. After my talk last night several people thanked me for my clear explanation how the US "missile defense" program is really part of a broader offensive first-strike attack program - the sword and the shield together. Bottom line is that the region is a trip wire for war. Thank goodness that there is an active and strong peace movement here. Everywhere I have been so far in Japan people come up to me and tell me that they were friends of Satomi Oba. 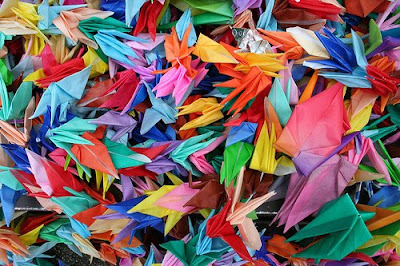 Satomi died suddenly a couple of years ago and was a huge loss to the peace movement in Japan. She was also on the Global Network's board and was our key link to Japan. She translated one of our space videos into Japanese and spread it around the country. Several times she translated our space week posters and distributed them far and wide. When I spoke the other night in Tokyo I saw her translated videos are still being sold. Satomi once told me how hard it was for women to have strong voices in her culture and sometimes she paid a bitter price for that. But she was a strong and gentle soul who is still revered by her fellow activists. She lived in Hiroshima and helped Atsushi organize a speaking tour for me around Japan in 2002. At the Global Network annual conference that followed her death our chairperson Dave Webb from the UK put the above picture up on a huge screen and played a song from The Kinks (he is also a fan) called Days. I put it here in her memory.